The 18 apartments on the Greenfire Campus in Ballard were kind of an after thought, and they won't be done until May, but there are already 160 people on the waitlist for a unit. The campus combines a new headquarters for an environmental philanthropy called the Wilburforce Foundation with some retail space, 32 parking places and apartments that have a lot of environmentally friendly features. The developer, Greenfire Group, is planning a grand opening event May 18 after more than a year of construction. 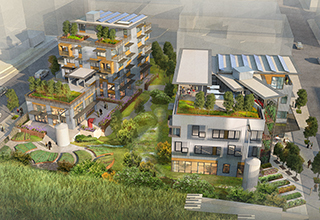 Each apartment will have its own P-Patch, and there will be wetlands on the site. Rose Letwin is the principal of Greenfire Group and the co-founder of Wilburforce, which awards grants to nonprofits for environmental conservation work in the western U.S. and Canada. Crews are finishing the office portion, which will house the headquarters of the Wilburforce Foundation. Grand opening is scheduled for May 18. While looking for a site to build space for Wilburforce, Letwin and her team kept coming back to an empty lot at Northwest 56th Street near the Ballard Carnegie Library. It was more land than they needed for just the office space, so the team started to think bigger. Adding apartments served the foundation's environmental goals by creating a live-work-play environment. “Why not make it so someone can live here, work at Wilburforce, eat downstairs, and come home and grow their own vegetables?” said Ray Johnston, partner at Johnston Architects, which designed the project. Skillet recently signed on to open a restaurant on the ground floor of the office building. Work is still underway on the space, and the restaurant could open as early as June. There is a little office space available. Wilburforce is taking the top two floors of the four-story, 18,500-square-foot office building, leaving one 5,000-square-foot floor for lease. A second restaurant space on the ground floor has yet to be filled. When Greenfire Group bought the land, a 157-unit condo complex had been approved, but the team decided to sacrifice density for more open space and green features. The apartments will rent for about $3 per square foot. They range from large penthouse-type units on the top floor to smaller lofts with high ceilings. Counters are made of Environite, which combines recycled glass and other sustainable materials. Greenfire Campus will have an office building and 18 apartments, with solar panels on the roof, P-Patches for residents and green space throughout the site. Abundant windows give each apartment lots of natural light. A first-floor common area provides space for entertaining and neighborly interaction. There is a large kitchen along with an entertainment center that would be ideal for watching the big game. A guest suite on the first floor can be reserved, a feature that could be useful to people who live in the smaller units. The laundry room is surrounded by a wall of windows that makes it look more like another entertainment room than a space for chores. “It's the best laundry room in Seattle,” said Bob Wicklein, principal at Seneca Group, which is the project's development manager. Twenty geothermal wells on the site heat and cool the buildings, and parts of the roofs have solar panels. Areas without panels are gardens for the residents. The roofs are designed to capture rainwater for landscape irrigation. Features like these don't come cheap. Greenfire Group's financial model assumes it will take more than 15 years to recoup the cost. But this long view allows the team to focus on sustainability rather than the bottom line, Johnston said. Most for-profit developers aim to recover their costs in five to seven years. Here is the project team: Walsh Construction, general contractor; WSP Flac + Kurtz, engineer; Robin Chell, interior design; The Watershed Co., landscape design; 2020 Engineering, civil engineer; DCI Engineers, structural engineer; RDH Building Sciences, building envelope consultant; SSA Acoustics; Blanton Turner, property management; Jones Lang LaSalle, office leasing; CBRE, retail and restaurant leasing. Groups of students from Washington State University are competing today to see who has the best proposal for how to do a real project for Vulcan Real Estate. As part of a senior project for WSU's School of Design and Construction, students were split into 12 teams of five to respond to Vulcan's request for proposals. Teams were asked to submit a package as if they had been short listed in a competition to create office space for Vulcan's Experience Music Project. Rick Cherf is the instructor of the class. The proposals include a discussion of the team's design principles, as well as cost and scheduling. 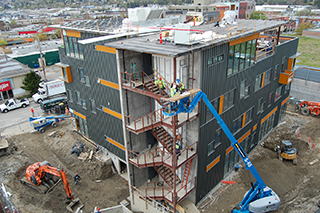 Students are using technology such as Building Information Modeling and Lean concepts. During the day, the 12 teams are pitching their ideas to a panel of industry judges. The top two teams will present their proposals tonight at the South Lake Union Discovery Center on Westlake Avenue. The event begins with a reception at 5 p.m. and presentations at 6:30. Cherf worked with James Broadlick, director of design and construction for Vulcan, to design the RFP for the competition. The EMP office building actually is a real project, and it is being built at 120 Sixth Ave. N. Construction began in June 2012 and will be complete June 1. The four-story, 54,000-square-foot building was designed by Collins Woerman and Howard S. Wright is the general contractor. EMP will move into the first three floors July 1, Vulcan officials said. The fourth floor remains available. Most job sectors locally continue to recover from the recession, according to Jones Lang LaSalle. The real estate company issued a report last week based on the Puget Sound Economic Forecaster that showed jobs in most sector in the fourth quarter of 2012 are ahead of the first quarter of 2010. Manufacturing, wholesale trade, and professional and business services have seen the most growth in the past three years. State and federal government jobs saw the biggest decline. One possible hiccup: military employment. The state has more than 62,000 military personnel. With wars in Iraq and Afghanistan winding down, and the impact of budget sequester cuts, the blow to military employment could be significant. The Forecaster predicts the rest of the local economy will pick up the slack. It projects 2.6 percent job growth in non-military sectors this year.